Liz Miklya, a vice president in the Minneapolis office of Weber Shandwick is the author of a chapter in the “PR News Media Training Guidebook – Vol. 4.” Miklya wrote the chapter on the crucial importance of television news to the media cycle and tips on how to prepare for a TV interview. Miklya, a former award-winning Twin Cities news reporter, has drawn on that experience in her frequent contributions to PR News about the best ways for organizations to work with the media. 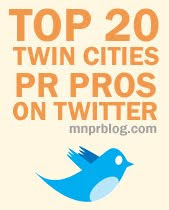 In 2009 she wrote a chapter in the “PR News Guide to Best Practices in Nonprofit Communications – Vol. 1”. Her work helps prepare company representatives and PR professionals to work with television, print and radio reporters to conduct interviews and effectively communicate their messages to key audiences. Topics that she has focused on include the “Art of the Sound Bite,” “Helping Time-Strapped Reporters,” and many others.